While you are trying to load and import a video file to iMovie, there is conversion to Apple intermediate codec (AIC) for iMovie to edit the file. Generally, the AIC conversion will generate a file with much large file size, and it takes a lot of time handling the files, especially for AVCHD camcorder .mts and .m2ts files. 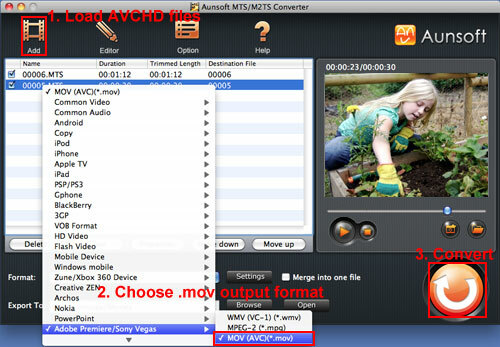 Aunsoft MTS/M2TS Converter for Mac is an excellent solution to convert Panasonic MTS/M2TS videos to iMovie with much easier and quicker workflow using the native MTS streams than the iMovie AIC conversion process. With the simple editing in iMovie, it is easy to share the video online like YouTube, or burn to DVD for home entertainment. 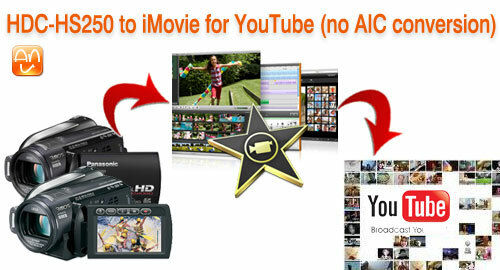 Below is how to convert Panasonic HDC-HS250 to iMovie without AIC conversion, and export for YouTube as an example. Step 1. Load Panasonic HDC-HS250 videos to Aunsoft MTS/M2TS Converter for Mac. Transfer .mts files from Panasonic HDC-HS250 camcorder to Macintosh hard drive, run Aunsoft MTS/M2TS Converter for Mac as the fast Mac Panasonic to iMovie converter, and click the "Add" button to load .mts videos. Click the "Format" option, and choose Adobe Premiere/Sony Vegas > MOV (AVC)(*.mov). The Mac Panasonic AVCHD converter will convert Panasonic HDC-HS250 MTS to MOV with H.264/AVC as video codec. Step 3. Convert HDC-HS250 MTS to MOV for iMovie. Click the convert button, and the Mac Panasonic MTS converter will start converting Panasonic MTS videos to H.246 .mov, and deinterlace 1080i videos to 1080p. Step 4. Edit HD videos in iMovie and export for YouTube. After the conversion, bring the output videos to iMovie. Through the iMovie interface with quick process to upload video to YouTube account, we can get small file for online sharing. Want to get your Panasonic AVCHD camcorder videos to iMovie? Try the Mac Panasonic AVHCD converter, and it is much easier and quicker with Aunsoft MTS/M2TS Converter for Mac to edit videos in iMovie and export files for YouTube, iPod, iPhone 3, iPhone 4 and DVD.